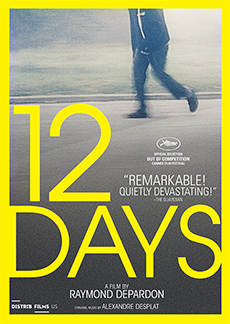 12 DAYS is included in the same DVD box set with JOURNAL DE FRANCE and FRANCE (LES HABITANTS). Every year in France, 92,000 people are placed under psychiatric care without their consent. 12 DAYS focuses on those who have been involuntarily remanded to a mental hospital, and more specifically documents the hearings that, according to a 2013 law, are required to take place 12 days after each patient has been committed. At these hearings, the patients are given an opportunity to argue for their freedom before a judge who ultimately decides whether they will go free or return for further treatment. Granted access to these hearings for the first time, celebrated filmmaker and photographer, Raymond Depardon, captures these extraordinary encounters between justice and psychiatry, giving a voice to those who have previously been voiceless. Encompassing questions of mental health, power, class, agency, and the dynamics of societal institutions, 12 DAYS is consummately controlled yet suffused with empathy and compassion.